The PALY ComedySportz troupe prepares to play a game of Celebrity Pun-ishment, where they make puns out of a celebrity’s name. Aaron Slipper, alum of PALY, was mentioned during the game. It’s 8:30 p.m. on a cold Friday night. A small audience has gathered in the Haymarket Theater, settling in the plush seats, waiting for the ComedySportz show to begin. The referee blows his whistle, and on cue, the players run by the aisles and take the stage, their infectious energy eliciting cheers from the crowd. Afterwards, there’s a moment of held breath as the audience silently waits for what is to come. After all, Palo Alto High School’s improv troupe is about to hold their very first comedy match, and no one has prepared any lines. 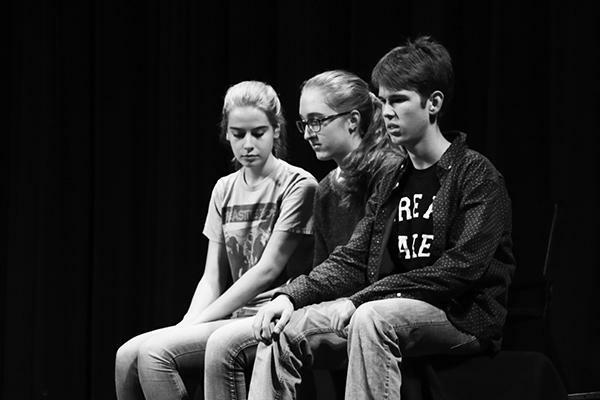 Improvisational theater, known as improv, is a form of theater in which actors create scenes on the spot. It can be a bit intimidating — even more intimidating if you’re playing it competitively, like a sport. ComedySportz is an organization that has competitive improv leagues all over the nation. While a typical improv show involves creating a scene on stage, ComedySportz takes it to the next level: making it a tournament. 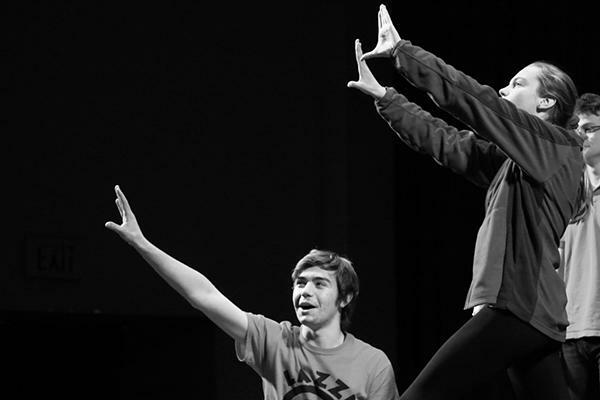 Two teams compete for points or laughs by improvising scenes, games and jokes based off of the audience’s suggestions. The referee blows his whistle to end intermission after halftime. Nobody is really sure what the score is, but the blue team appears to have the edge as they come in skipping down the aisle and up the stage. On the other side, the red team walks in, heads hanging down, fingers wiping fake tears and concealing smiles as they dramatically trudge down the aisle. This “just do it” mentality was precisely how Paly’s improv troupe became involved in ComedySportz. “It has been absolutely student-driven … and that might have been why it took so long for it to happen,” says Kathleen Woods, head of the theater department. 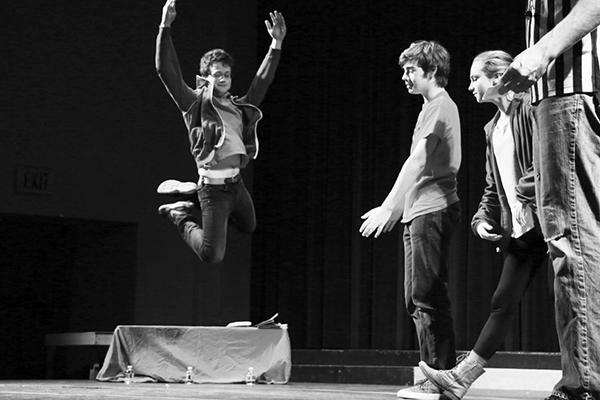 Senior Chris Hinstorff had been a part of Paly theater since his junior year and was encouraged to explore the ComedySportz organization after attending a Thespian Leadership meeting. 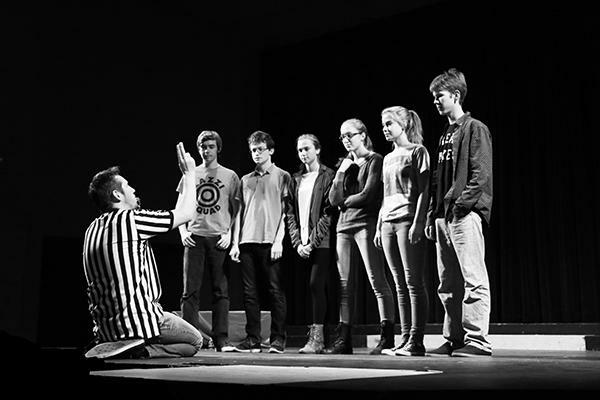 Although the improv troupe was created a few years before, Hinstorff has helped the group evolve into a high school ComedySportz troupe, the first in PAUSD according to Woods. Their first competitive performance, on Jan. 20, marked the beginning of what they hope to be a regular occurrence. The troupe practices Wednesdays during lunch in the Haymarket, when they play improv games such as Celebrity “Pun”-ishment, in which the troupe takes a celebrity’s name and tries to make as many puns out of it as possible. Team practices are essential for the improv troupe, where the quality of their performance depends on the chemistry between the members. According to O’Riordan, improv is all about collaboration. The blue team contemplates which game to play to keep their lead over the red team. The blue team consisted of (from right to left): sophomores Joey Kellison-Linn and Andrea O’ Riordan, and junior Sophie Swezey. Improvisation requires one to prepare for the ups and downs of comedy. Sometimes the actors connect to the audience, but many times what they believe to be funny is unamusing to the audience. In this sort of situation the improvisationalist has to try something different. Naturally, it takes a certain amount of bravery to do improv. Many members of the troupe find themselves overcome by nerves and have learned to push through in order to reap the rewards of performing. Humor is all about the individual’s unique perspectives. Personally, blue team sophomore Joey Kellison-Linn has pondered furiously over how far he is personally willing to take humor and what he feels is appropriate to joke about, but at this moment in time he remains undecided. Improv does not come easily to everyone every day of the week. A good portion of the troupe regularly experiences off days. Despite the odd bad joke that elicits an audience eye roll, the experience generally builds confidence in the performers. As the competition winds down on stage it is important to remember that improv is all about getting a good laugh and supporting local up-and-coming artists. The red team improvises scenes based off a noun, verb, and adjective suggested by the audience. The red team consisted of sophomore Jason Pollack, junior Zoe Limbrick, and senior Chris Hinstorff.